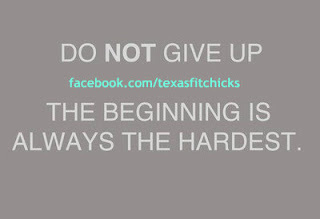 Texas Fit Chicks Boot Camp is most effective for our chicks when they follow a good nutrition plan! Eating clean is critical to changing your physique. Hope these 9 tips help you on your weight loss journey. Hi, my name is Sandy and I am a certified Personal Trainer and Boot Camp Instructor with Texas Fit Chicks. I was going through photos the other day looking for a specific picture for my daughter and I came across the picture you see below. I starred at that picture for about 10 min with all these thoughts going through my head. I decided that since I ask my chicks to share their story, that I would share mine. I have always been a fit person. I played soccer all through school and even played after I graduated. I kept up a gym membership and worked out regularly. Even after having twins, my body bounced right back to where it was previously. It wasn't until we got pregnant with our son and I gained more weight then I did with the twins. I really didn’t care because I was just so happy - a new baby was on the way. At 36 weeks pregnant, the world came crashing down. I delivered a beautiful 6lb, 14oz 21” long baby boy by emergency C-section. He was perfect in every way a baby could be, but because of the circumstances, he had no brain activity and 1 week later we were planning a funeral. We came home from the hospital with all of the wonderful baby gifts that were still in the living room from the shower. I was told that this happens to 1 out of a million women with a previous vertical C-section…..REALLY, I’m the “1”???? The next two years were a blur, living that day over and over. I didn’t want to look at my body because I blamed it for this tragedy. I never could eat when I was stressed, but for some reason this was different. I didn’t care what I ate or how I looked anymore. I lost some of the weight, but not much. I finally got down on my knees and told God I couldn’t bare this pain anymore and for him to take it away….he did, every day got a little more bearable. Two years later to the date of finding out we were pregnant with our now angel, we were pregnant again - believe me….we were not trying at all. At the exact same time….REALLY???? We saw a high risk specialist and I was under a microscope. I had gained the usual pregnancy weight, but not much more because I was on a very strict diet, but still had the previous weight on me. Thirty (30) wks later, the same thing happened except for this time, I was already in the hospital. We had a beautiful baby girl that was 3lbs 5oz, 12” long and could fit into her Daddy’s hand (that‘s one hand). Let me just say that today, she is a beautiful (inside & out) healthy, wonderful, kind, smart young woman with the biggest heart and I’m proud to be her Mom. The picture below of me was when she was about 2 years old. Nope, I wasn’t pregnant at the time although it sure looks like it. My body had gone through so much trauma over that past 4+ years of 2 emergency C-sections (almost dying from both), mentally exhausted from pain and worry that I thought this was the new me. So I thought!!! I got my gusto back when I took a hard look at pictures and didn‘t recognize the person in them. My daughter fought for her life in NICU for 7 weeks and I need to start fighting for mine. I didn’t want her to think this is healthy or to look at previous pictures of me and wonder why I was so overweight now. So I started exercising regularly, pushing the inner athlete like I knew I could (everyone has one) and from that point forward, never looked back. By no means am I saying it was easy, because it wasn’t, but it is possible. You will have to fight for it and you are worth fighting for. 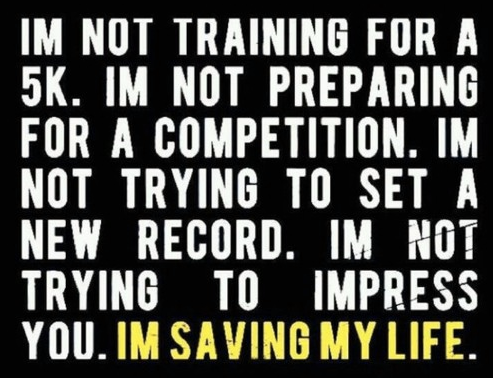 I am now a Certified Personal Trainer and absolutely LOVE what I do. So as your trainer, instructor and friend….when I say “I understand”, it may not be the same situation, but I do know what it’s like to be in an awful place that you think you’ll never get out of. “I do understand” how tough this journey is going to be, but also how wonderful and worthy it will be when you reach your goals. “I do understand” because I’ve been there. When I tell you to “fight for it”, it’s because I know what it’s like to fight. When I tell you “don’t stop”, it’s because you can’t or you might not start again. 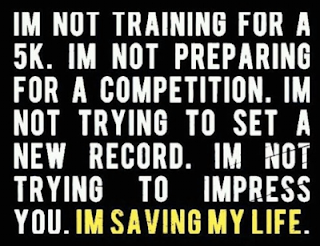 When I tell you “you need to be here every boot camp”, it has nothing to do with money. When I tell you “don’t listen to that voice that tells you what you can’t do”, it’s because I had that voice in my head. It’s freeing to look in the mirror and not hate what I see anymore. Although there was tragedy, there was also blessings and God has guided me every step of the way and brought me through the tragedy so I can be the best example to my daughter and stand before you and guide you to a new life. OMGOSH. 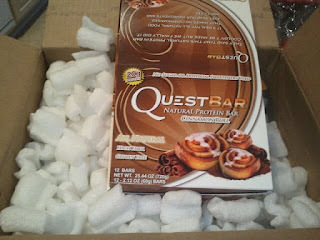 I just cracked open my box of Quest Protein bars ~ their new flavor Cinnamon Roll is... TO DIE FOR. Microwaved for 13 seconds, get me a fork. It's my new favorite 3pm afternoon snack - that gets me through the afternoon! I don't know about you - but I don't want to ruin my hard work on a protein bar that isn't good for me! 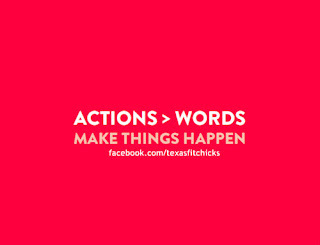 I'm so excited to announce that Texas Fit Chicks is now able to offer them on our website. You can order online and have them delivered right to your front door. 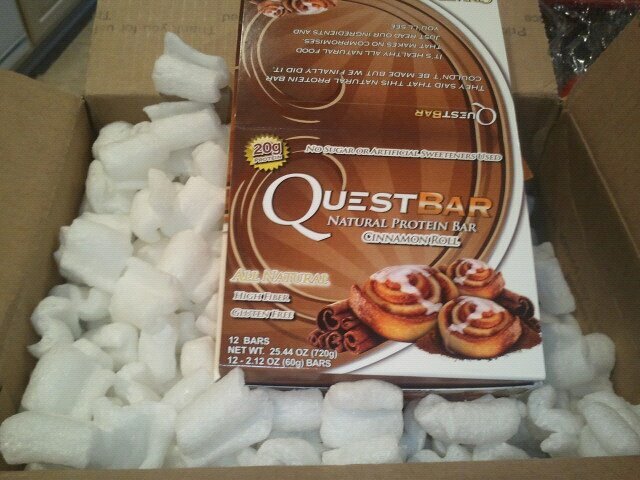 Purchase through this link below and get your Quest bars on their way! Texas Fit Chick Christy wins Kidd Kraddicks' I've got a dream contest!! Next time you turn on your favorite show - make it live (no dvr to fast fwd) and do this workout during the commercials! Most hour long shows have around 18-20 minutes of ads, so I've created a workout for you to burn some calories at home. Feel free to forward this email and share with some of your favorite couch potato friends! No equipment needed. Ready...set...GO! 20 Pushups - Try to do at least 2 on your toes, then drop to your knees if you need to. 20 Prisoner Squats - Finger tips behind ears, chest lifted slowly squat down then up - making sure that knees don't overshoot your toes. Good way to make sure you've got good form is to lift your toes in your shoes, keeping weight in your heels. Forward/Reverse Lunges - Plant left leg and step out with right leg into forward lunge position, bring right leg back to center, then drop right leg behind you for a reverse lunge. 1 minute on each leg. Squeeze Planks - Grab a stop watch - in plank position (on forearms) shoulders over elbows. Lift up into plank position keeping a straight line from head to heels (booty down) and squeeze everything (including glutes) for 15 seconds, then drop down for 5 seconds. Repeat 7 times. Be sure to breathc while you squeeze! Be sure to stretch for 5-7 minutes at the end of your workout. WAY TO GO! Finishing off a whole pack of chips while engrossed in an interesting show is the perfect example of mindless eating. Distracted by watching TV or a movie, we mindlessly fill our mouths, short-circuiting our fullness signals. We keep on eating unaware of the huge amounts we're putting away. In my opinion this is an oft-overlooked cause of obesity. The modern food supply encourages a grazing mentality via fast food drive-ins, vending machines full of snacky-junk food and confectionery counters at every retail outlet. What's more it actually encourages us to eat while doing other tasks. "Multi-tasking" has long been a business buzz word but is often just a euphemism for eating while doing other things. Whether it's popcorn at the cinema, desktop dining while you work, dashboard dining as you drive or dinner in front of the TV, it all leads us to eat more than we need. Dr Brian Wansink, author of the book "Mindless Eating: Why We Eat More Than We Think" (Bantam Books 2006), says most of us overeat because we are distracted or are surrounded by junk food served in large portion sizes. We eat as if it's our mission to finish everything! In one famous experiment, Wansink and his researchers offered a free bucket of popcorn to moviegoers in return for answering a few (dummy) questions about the movie once it was over. Half the moviegoers got a medium-size bucket weighing 120g or 4.2 oz, while the other half were given the large-size, bigger-than-your-head, bucket weighing 235g or 8.4oz. Weighing the leftovers in the buckets after the movie, the researchers reported that the big-bucket group ate 53 per cent more popcorn (an average of 725 more kilojoules or 175 calories) while mindlessly munching. That's roughly the equivalent of 21 more dips into the bucket. Wansink repeated the experiment with stale, 14 day-old, popcorn and got similar results. After the movie, the researchers asked the moviegoers to describe the popcorn and they weighed how much popcorn was left in the containers. Even though they described the popcorn as "stale" and "terrible", moviegoers with the larger containers still ate 34 per cent more than those given the medium-sized containers. To help yourself learn to eat with awareness, try these simple first steps to practice eating mindfully and prevent mindless consumption. Your goal is to be conscious of how you're eating and what your stomach registers. When you're in touch with what is going on inside, you'll know the exact moment you are physically satisfied rather than over full or stuffed. It's the best technique for weight control and works regardless of what sort of diet you're on. I follow these steps every day and highly recommend this way of eating! 1. Sit down to eat, even if it's only for a snack. Turn the TV or laptop off and don't read. Let the food be the sole centre of your attention. 3. Chew each mouthful thoughtfully paying attention to the flavours and textures - some health food advocates have suggested at least 30 times per mouthful *. Put your knife and fork down between bites. 4. If you know you're a fast eater, make a conscious effort to slow down and be the last one finished. 6. Eat slowly and make the meal last at least 20 minutes. Making these changes can lead to weight loss ~ We hope they are helpful! 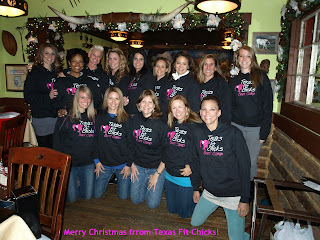 Texas Fit Chicks are a team of personal trainers that lead Women Only boot camps. We serve clients in McKinney, Prosper, Anna, Wylie, Plano, Richardson, Dallas, Frisco, College Station, Spring, Braes Heights (Houston), Mesquite, Colleyville, Carrollton, Lancaster, The Colony, and Keller Texas. All levels welcome - start any Monday! Is Sugar Sabotaging your Fitness Goals? Sugar is hiding everywhere. It's not just about cutting out cake, cookies and candy...though that's a great place to start. Do you know how much you are consuming? If you are a typical American, you may be eating 156 pounds per year! That’s how much the USDA says Americans consume each year on a per capita basis. Sure, some of that comes from standard junk food but much of it comes from more “hidden” sources. Sugar for many is something they may have been battling with for a long time, but the past is the past. Time for sugar to be seen for what it really is, and for us to take back full control of our lives. Here’s a simple three-step process to help you start to win back the battle for your health. I think most people I talk to will say they “know” that they shouldn’t have sugar, but they really can’t help it. To me that is a lack of true awareness of what sugar does to oneself. I don’t think many people will say that they want to hurt their body on purpose, but unless they know it’s really happening they will continue down that road. Sugar is slower to impact our health (as we don’t die from an overdose right away), and it’s that slow destructive process that is the most dangerous. Unfortunately most people don’t know the damage until it has already been done (diabetes for example). Let’s look at what is really going on with sugar from inside our body’s point of view. •Sugar increases fat storing. Possibly the most important hormone in the body when it comes to weight loss and health is insulin. Insulin is the main hormone that we have full control over daily through our diet and lifestyle. When we eat sugar and it enters into our bloodstream too quickly, we have a spike in blood sugar levels (hyperglycemia). Now in times of high activity we are able to burn it off, but if we are sitting around this is not a good thing. So in response to that high level of blood sugar (known as glucose), the body will release more insulin into the bloodstream. Insulin will then take the excess glucose and try to find a place to store it. If your muscles are all full (or have insulin resistance) then the best place to put the excess glucose is fat cells. When insulin is high, the fat cells are told to start storing (shutting down any process of releasing stored fat into the blood for burning). With chronic high insulin spikes comes a resistance to it (insulin resistance) by your cells, leading to more insulin production, leading to more fat storing, and more resistance, eventually going down a road of diabetes and ill health for the whole body. It’s interesting to note that in cultures known for their longevity, many had different diets and lifestyles but the one thing they all had in common was low fasting insulin levels. •Sugar disrupts normal brain function. I think most people can relate to mood swings and energy highs/lows that come after a high sugar meal. Sugar can also be the source of many people’s increased anxiety and depression. Let us not also forget the kids with ever-increasing attention “disorders” and behavioral issues. Sugar is not helping with that, either. In fact, there have been many studies that show when taking sugar out of a kid’s diet and increasing fat intake, their attention/learning ability increases, their behavior changes for the better, and in some extreme cases have been able to manage (if not eliminate) seizures. The brain is made mostly of fat and although runs on glucose it gets “shorted out” with too much sugar. •Sugar decreases your overall health and makes you age quicker. Too much sugar will lower your overall immune system, increase destructive inflammation, lead to essential mineral deficiencies in the body, feed bad bacteria growth in your gut (all health starts in the gut) and other wonderful stuff. Aging is just a fancy word for the body breaking down quicker than it can repair itself, as that is what happens when we get older. Aging also is accelerated by the increasing risks of all degenerative diseases such as diabetes, osteoporosis, heart disease and cancers. We are all going to get older, but it doesn’t mean that we have to “age” quicker. •Increase fat burning ability of the body. •Increase the immune system and state of health. •Slow down the destructive aging process. •Decrease risks for most degenerative diseases. •Have steady energy all day long (no crashes or swings). •Have increased mental clarity, focus and concentration. •Increase positive behaviors in children (as well as adults). So first step is that we need to be aware of what sugar is really doing in our bodies. Once we see what is happening, I think we can start to change our view on whether it is our good friend or possibly public enemy #1 in our daily lives. To have better health and reach your fitness goals, it's mandatory that you read labels and know where your sugar intake truly comes from. Here are 6 sneaky places that sugar hides ~ you might be eating more than you think!! YOGURT - Generally, this is a food that people consider “healthy”. However, unless you choose the Plain flavor, you’ll be getting a lot of sugar. Check the label and you’ll find on average about 20 to 25 grams of sugar in a measly 6 ounces. Choose greek plain yogurt, sweeten with a little Truvia or Stevia and mix in 1/2C frozen blueberries. Problem solved! SALAD DRESSINGS - Salads have always been a great choice when trying to lose weight. But, not only can they be laden with fats, but even the healthiest, veggie-packed salads can pack a sugar punch from the dressings that accompany them. Choose an oil-based dressing and ask for it on the side, so your lettuce isn't taking a bath on your plate! SOFT DRINKS - Here’s where a huge portion of consumer sugar intake is found. Studies show that soft drinks account for as much as 33% of all added sugars consumed. And if you think switching to sugar-free diet drinks is the answer, think again. The risk of obesity appears to be higher among diet cola drinkers. Recent studies show that those who drink diet soda eat more junk, since they end up craving sweets more often. Choose to sip on green tea or Crystal Light Pure - both great options! CEREAL - Checkout the serving size on the back of the box. A serving is often only ¾ cup which means most people tend to have at least two servings at breakfast. Plus, cereal is often eaten as a snack as well, and a few handfuls can quickly add up. Many cereals that tout themselves as being healthy have more sugar in them then a candy bar. Kashi offers a great selection of cereals that are all low in sugar. Another option would be to choose steel cut oatmeal for breakfast to fill you up for the day. PROTEIN BARS - Many times they are glorified candy bars! Several on the market disguise themselves as being packed with protein and all natural ingredients, however, the huge sugar content diminishes their nutritional value. In some cases, you might actually be better off grabbing a chocolate candy bar. 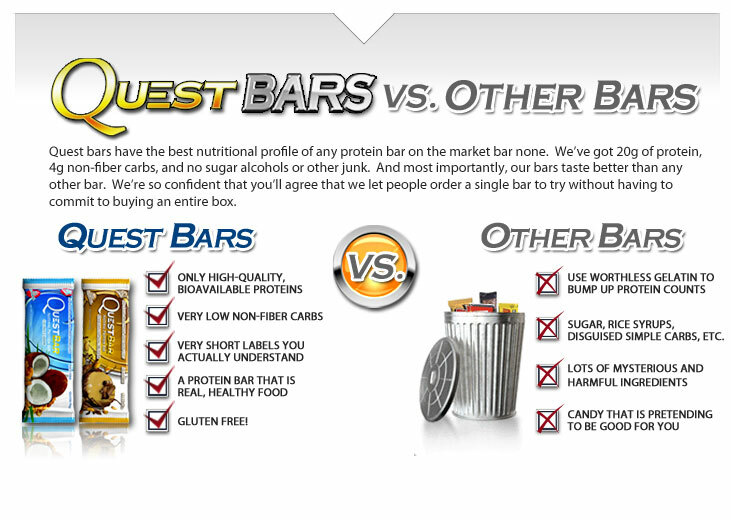 Choose Supreme Protein bars, or look for one that has less than 12g sugar. LOW FAT FOODS - Fat makes many foods taste good! When fat is eliminated,often the flavorful taste disappears too. To prevent a low fat food from being too bland, manufacturers regularly add extra sugar to ensure a good taste. So while the fat grams may be low, there are plenty of calories because of the extra sugar. Choose foods that are not processed, and eat "clean" 90% of the time to avoid the extra sugar that's often packed into 'lowfat' foods. Why do you need to watch your sugar intake? Most experts agree that sugar in its pure form is not inherently “bad” for you. The problem with sugar is that it packs a lot of calories per serving. Plus, since foods with sugar in them taste good to most people then we eat larger portions of those foods. Therefore, we consume more calories when we eat high sugar foods. In 2003, the World Health Organization released guidelines indicating sugar should account for only about 10% of our daily calories, which is roughly only eight teaspoons. Most labels refer to sugar in grams -- eight teaspoons is about 37 grams. What does that mean to you? Well, one six ounce yogurt and one cup of many brands of cereal will quickly put you over that recommended limit. Whenever you read the ingrediants, the first 3 labeled are the most prevalent in the food. If sugar is the first ingredient listed on a food, you probably should consider putting it back on the shelf. And remember, there other terms for sugar that food companies use. It also is referred to as high fructose corn syrup, glucose, sucrose and other names. Pay extra attention to the foods mentioned in the hidden sugars list above. And, if eating high sugar foods, limit your portion. 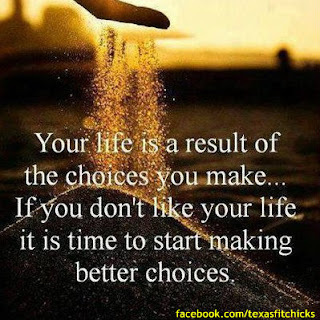 Make 2013 your healthiest yet. 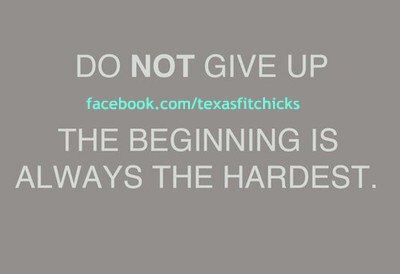 Let Texas Fit Chicks Bootcamp help you lose weight and change your body! Our fitness boot camp trainers are all women, and have a passion for helping other "chicks" reach their goals! We have locations in Dallas, Mesquite, Anna, Wylie, McKinney, College Station, Colleyville, Celina, Van Alstyne, Richardson, Keller, Allen, Prosper, Plano, and Frisco and are for all levels of fitness Join us on any Monday and be on your way to becoming our next FIT CHICK! This one thing can help you lose weight, and keep it off! A recent study from the Kaiser Permanente Ctr for Health Research, found that logging what you eat regularly can help you shed nearly two times more weight than if you don't keep a journal. If you are trying to lose weight and keep it off, something as mundane as recording what goes into your body can be a powerful tool to help! There are a couple of reasons that food journaling works. First off, you might re-think what you are about to mindlessly eat. Do you REALLY want to write that you scarfed down a bag of M&M's for your 4pm snack? Another reason it works is because it can teach you how many calories are really in that starbucks latte with whip cream and chocolate drizzled over the top! Ignorance is not bliss when you are trying to keep track of calories you consume in a day. Another reason it works is you can find out if you are not eating enough. I have had clients in the past that, after journaling their food, we find out that they are only taking in 800 calories a day....and 200 were from alcohol! The goal is to keep the metabolism running efficiently and burning those calories all day...not slowing to a crawl because it thinks you are in starvation mode. Here are a few ways to make food journaling work for you! Track your normal eating for 2 weeks. This gives you a baseline. Also include the amount of water you are drinking. I have several clients that track their food on their phone...there's an app for it! How easy and convenient..you don't even have to dig through the kitchen drawer for a pen! Write (or type) down everything you eat, right away. You can look up the caloric content later, but get it down asap. OR if you don't have time to type it in - take a picture of your meal with your phone...and figure it out later! Learn Portion Control. Even though something is good for you - too much of anything is never good. Measure it if you aren't sure! 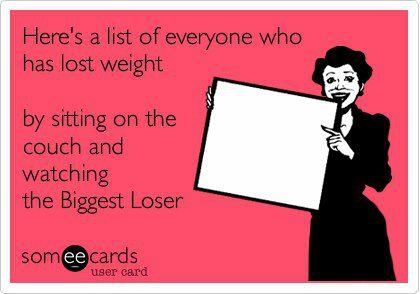 If you create a 500 calorie deficit each day, you will lose 1 lb per week! It's always been about calories in vs calories out...and always will be. This year, make a resolution to track your food for the next 2 weeks. 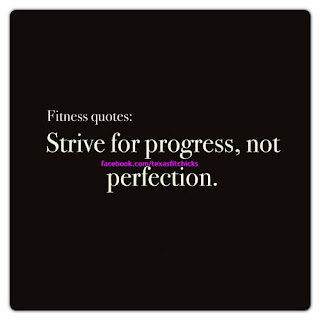 That's an attainable goal, and will help you stay on track!! Check out our new prices for the NEW year! 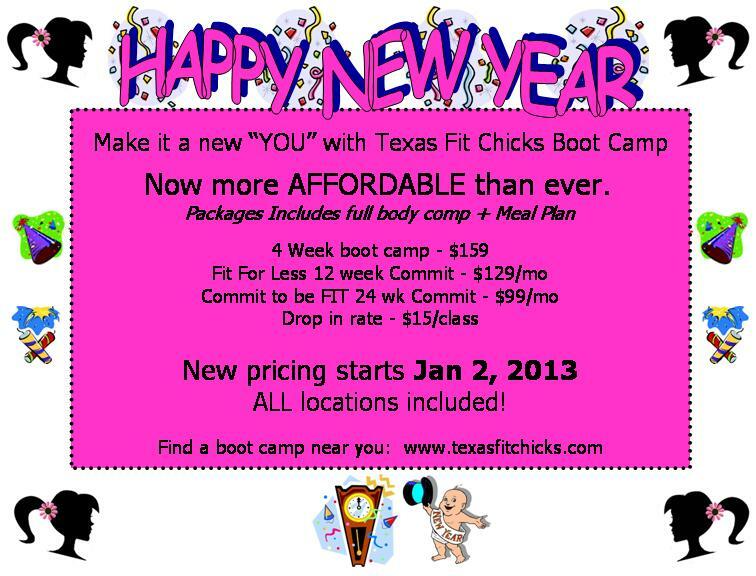 Better time than ever to become a fit chick with us! 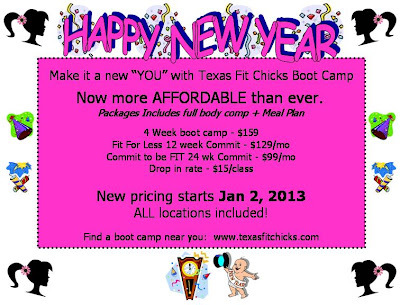 Start 2013 off with a bang and Commit to be FIT! 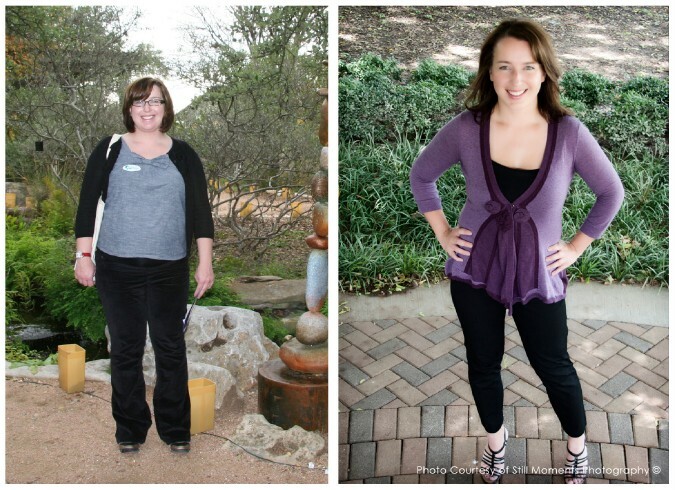 Texas Fit Chicks Boot Camp specializes in helping women lose weight. After learning how to eat clean and becoming consistent in my workouts, my hypothyroidism is under control and I'm able to stay at a healthy weight. The key to success is to eat clean 90% of the time and 10% of the time, indulge. 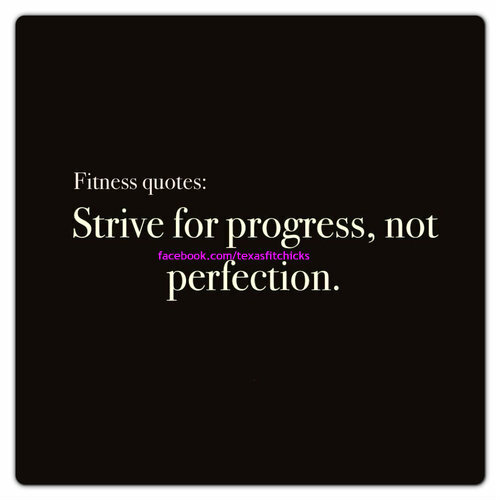 Our expert trainers are here to help you find consistency and we hold you accountable if you miss a workout! 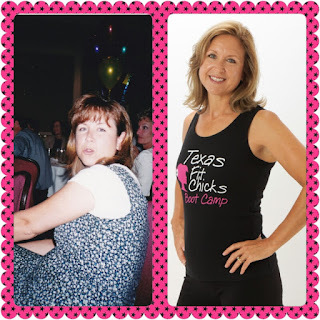 Texas Fit Chicks Boot Camp has over 25 locations and times, including Prosper, McKinney, Wylie, Anna, Frisco, Allen, Plano, University Park, Richardson, The Colony, Mesquite, Fairview, College Station, Houston, Spring, Colleyville and Keller Texas!